Sony today boosted its Cyber-shot® line-up of travel high zoom cameras with the launch of the DSC-HX99 and DSC-WX800. Designed for users who want an unobtrusive camera that can always be carried, the new models are packaged in the world’s smallest body and offer a truly versatile zoom range from 24mm1 at the wide end up to 720mm1 super-telephoto. In addition to stunning 4K2 movie footage, at the heart of both models sits the powerful BIONZ X image processing engine combined with a front-end LSI that delivers high-speed continuous shooting at up to 10 fps with a buffer limit of up to 155 images. Furthermore, these new models present a fast AF speed of 0.09 seconds. Some newly added features are Eye AF, Touch Focus/Touch Shutter function, and location data acquisition via Bluetooth®. The HX99 comes with advanced features that make your photography experience more comfortable and adept at the same time especially due to the ability to shoot in RAW format and maximum ISO6400, eliminating the difficulty of shooting in low-light conditions. In terms of convenience, the HX99 is equipped with a Control Ring which can be customized with functions such as manual focus or step zooming. In addition to a Touch Focus/Touch Shutter function which allows users to directly select subjects, it features a TouchPad function delivering smooth focus point shifting while using the viewfinder. Furthermore, the built-in high-contrast retractable OLED Tru-Finder™ with approximately 638,400 dots (equivalent) delivers power-packed performance in a compact body. The HX99 features an upgraded3 grip which gives photographers a firm hold and greater stability during shooting, making it the easiest companion to take along on your journeys. often occurs during handheld and telephoto shooting. The models are also equipped with a Zoom Assist function that allows the user to zoom out temporarily and displays a wider area when shooting a subject at the telephoto end. As the perfect picture often occurs unexpectedly, photographers need to be able to trust their camera to react quickly. With a Fast-Intelligent AF speed of just 0.09 seconds and an upgraded3 BIONZ X processor and front-end LSI, the HX99 and WX800 are a perfect fit, delivering high-speed continuous shooting at up to 10fps for up to 155 images. For beautifully focused portraits, the new models inherit the much-praised Eye AF technology from their α™ siblings and for photographers who prefer to enhance their photos with image editing software. Embracing feedback from users of the HX90 series, Sony has implemented Touch Focus and Touch Shutter functionality on the HX99 and WX800 so that the photographer can directly select their shooting subject, both the HX99 and WX800 offer My Menu personalization for instant recall of up to 30 items and the ability to create custom menus. 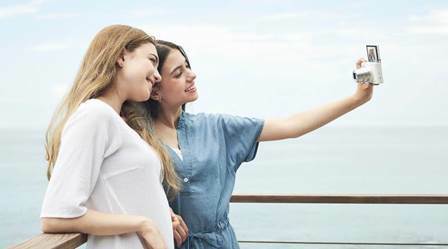 A 180 degrees tilting LCD screen allows for easy framing of selfies and group shots location data acquisition4 via Bluetooth® can collect and record location data from a mobile device (Location Information Link) and small size proxy recording allows transfers to smartphones or uploading to websites for quick sharing. The new HX99 (at net cash Php28,999.00) and WX800 (at net cash Php24,999.00) will be available in all Sony Centers and authorized dealers on November 17, 2018.